Hillel hosted Good Deeds Day Sunday to give students an opportunity to do a good deed and engage with the community. This year’s theme was Tie-Tie-Thai, featuring three activities, tie-dyeing, tying blankets and Thai food. The activities were located in the La Plata basement on North Campus and the Rosenbloom Hillel Center. “This is the Good Deeds Day we do in the fall semester and it tends to be smaller because this is kind of a preview to our bigger Good Deeds Day in the spring,” said Talia Orencel, Hillel director of engagement and social justice. Good Deeds Day is an international day of service founded in 2007 by Shari Arison, an American-born Israeli businesswoman and philanthropist, celebrated on April 2. Hillel has hosted Good Deeds Day during the fall semester for three years to allow students to do good more than just once a year. Members of the ZBT fraternity tying blankets together for children in the Lupus Foundation. Ashley Peccerelli/Mitzpeh. 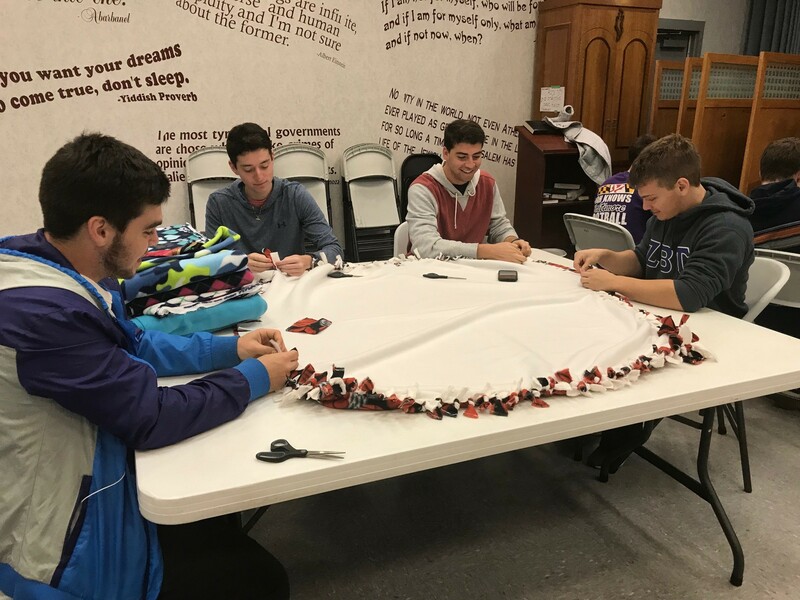 Members of the Zeta Beta Tau fraternity helped tie blankets to donate to children at the Lupus Foundation as well as members from the student and Jewish community. “I’m doing this because I love it and people who are in need will appreciate it,” said junior computer engineering major and ZBT member Alex Pollack. This is the first year Hillel gave Good Deeds Day the theme of Tie-Tie-Thai. “You do some tie-dye, you tie some blankets and eat Thai food and so far it’s going great,” said Orencel. Koby Nachenberg, a junior civil engineering major and ZBT member,, talked about what the day means for the greater community. 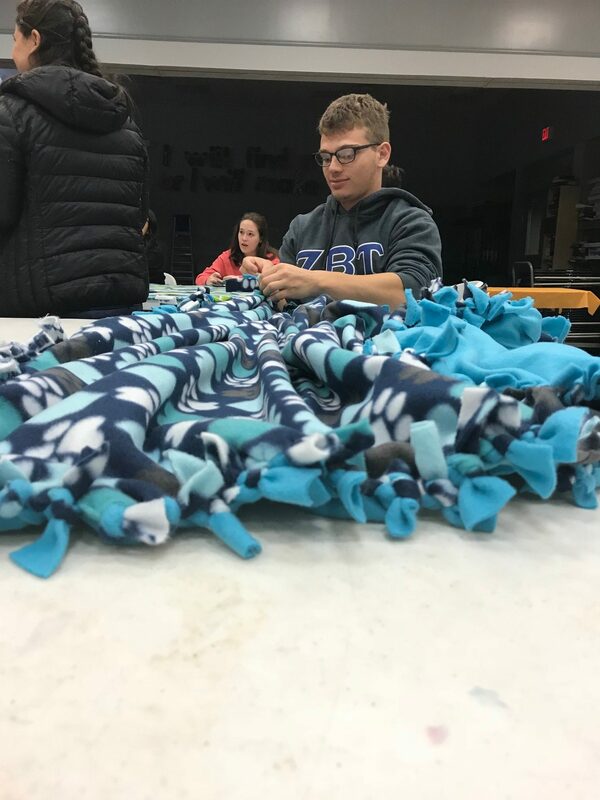 ZBT member Koby Nachenberg works on his blanket. Ashley Peccerelli/Mitzpeh. Good Deeds Day isn’t limited to the Jewish community. Anybody is allowed to participate and do good for the larger community. “Students who are not just part of the Jewish community participate, which is fantastic. I love projects when they go beyond the Jewish community because it’s a great way to bridge the gap,” said Orencel. Good Deeds Day is a chance to give back to the community and do something meaningful, said freshman communications major Anna Kaplan. “We want people to have a good time giving back to children at the Lupus Foundation and we are happy to take whoever is open to help,” Kaplan said. No Replies to "Hillel hosts fourth annual Good Deeds Day with “Tie-Tie-Thai” theme"